In theory, you can just buy a used parachute, arrange a jump with someone with an airplane (or do a BASE jump) and start skydiving on your own. In practice this is quite an insane thing to do: you will not know how to attach your parachute, you will not know when to open it, you will not know where and how to land. Even if a friend gave you some instructions or you read them online, they can’t replace professional instructions. This article is not endorsing any specific skydiving school. It only gives you some more reasons (apart from the obvious) to go ahead and take skydiving lessons before your first solo jump. 1. Try what is it like before spending money on equipment. I’d even suggest you to just have a tandem jump first. You don’t even need training for that. Many people think they will enjoy skydiving, but they quickly discover it’s not for them. It’s better to discover this on your first entertainment tandem jump or during the skydiving lessons rather than after you have bough lots of expensive equipment. You must take professional instructions if you want to be safe when skydiving, period. Sure, there are some self-taught skydivers who can do wonderful things but they are exceptions. Without professional instructions most people can learn just to open the parachute and land safely at best. On the other hand, at some skydiving school you can learn wonderful skydiving disciplines that the others can only dream about. Landing is one of the really important part of the safety. The instructors will teach you how to land without fracturing your knee or leg. Accelerated freefall is one of the disciplines you’ll learn in almost every skydiving school. And it’s one of the most useful and entertaining parts of the training. 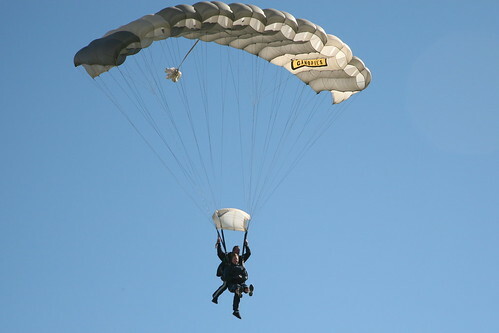 In the skydiving schools you may be able to try some high class parachute and other skydiving equipment which otherwise might be too expensive to buy. You can meet other like-minded people, have fun with them, organize parachute jumps together after the training, and even fall in love with someone. There are even more reasons to take skydiving lessons but these 7 are most important. If you think of any reasons not to take professional lessons, I’d be happy to hear them in the comments.